Every time Michele Colon pulls out her black belt from her bag, she can’t believe it is hers. Michele had an unorthodox journey to earning her black belt, a feat she accomplished under Marcio Santos and Carlos Machado in February 2018. Michele began her Jiu Jitsu journey in 2002 when she was in her late 30s. She subsequently also trained in in Jeet Kune Do, Wing Chun and Muay Thai. She continued training in Wing Chung until 2014, and trained in Muay Thai off and on for several years. Jiu Jitsu, though, is the art that stuck. When she began training, women were scarce on the mats, and Michele often felt overpowered and frustrated at first. She felt that she was not good enough. Once she discovered the right gym and the right instructor in Marcio Santos, Michele discovered the joy of Jiu Jitsu. Michele injured her ankle in a freak accident outside the mats, and endured three reconstructive surgeries to fix it. She thought she would never get to train in Jiu Jitsu again, but she persevered and began anew. Recently, Michele has faced a new twist in her training, as she has lost most of her sight. Michele rolls on, however, and says that without her sight she is more sensitive to the movements of her partners. With these challenges, Michele has had times when she wanted to quit. She wants to encourage those women who are thinking about giving up the sport. 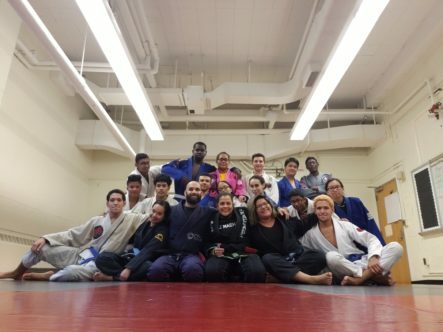 Michele teaches computers at Pelham Preparatory Academy High School in the Bronx, and as a brown belt in 2016, she joined fellow brown belt Fernando Restrepo in beginning a Jiu Jitsu school for the high school’s mostly inner city students, called Ascend Jiu Jitsu Social Project. Michele now runs the school herself, and even though she has reached a pinnacle of Jiu Jitsu as a black belt, teaching these kids is the best reward. “I am most proud to help the kids.” In the future, Michele hopes to continue working with the kids, and wants to open an academy and “spend my entire days hanging out in my Jiu Jitsu PJs teaching and learning Jiu Jitsu.” She also wants to compete at least once in the world Masters, so she can support the brackets for older women. I know well that this event is the greatest time to grind and all, but like what you said: don t lose sight of what s really important. It might be your family. It might be your closest circle of friends. I could even be your job, education, your social life, and so on.